Arabian alchemists, including Rhases(860-940) and Avicenna (980-1037), described the preparation of the water of life and the distillation method used to enrich the product by conveying the alcoholic vapours through ash or quicklime; they also distilled mercury and perhaps alcohol, without knowing it. The word alcohol, from the Arabic al-kohol, originally meant fine thing, a very fine black powder used by the women as an eye lotion or eye make-up. The Arabian alchemist Abou Moussah Djfar-Al Sell, also known as Geber (702-765), described the apparatus used to distil plants, including rose water, essential oil of which was recommended as a cure for many ailments. Arabian science had the great merit of handing down the knowledge of distillation to European science in the Middle Ages. Of great importance was the Salerno School which, as of the 10th century, gathered this knowledge and addressed it in an orderly way. Later on, alchemy spread increasingly and was even practised in the monasteries. In these places of culture, we find learned men such as Alberto Magno (1193-1280) who, in some of his writings, spoke of an aqua ardens obtained from wine and so light as to float on olive oil. 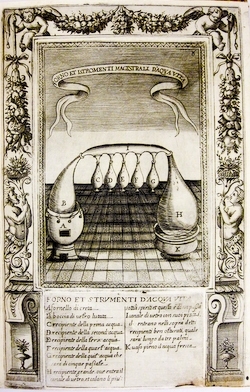 In the Vatican Consilia codex of 1276, Taddeo Alderotti of Florence (1215-1302) describes in detail the production of aqua-vitae obtained from wine with double distillation. Alderotti was also the first to speak of the coil immersed in cold water in order to condense the vapours. Nearly a century later, the preparation of aqua-vitae from wine became popular after the Padua doctor Michele Savonarola (1384-1462) published the first treatise on its preparation: “De Conficienda Aqua Vitae”. Venice was very important in the sector of distillates. Distillation spread in Veneto between 1200 and 1300, when Venice was an important market-place for marc and wine aqua-vitae, which it exported to Germany and the Orient, as a cure for the plague and gout.